COMPATIBILITY • Touch-screen • Mouse • Graphics tablet • Topaz Signature Pads TRANSACTION LIST • Invoices • Credit Notes • Sales Orders • Purchase Orders • Quotations • Return Authorities • Stock Returns • Stock Receipts • Stock Transfers • Requsitions REPRINTING • Use the CAPITAL Visual Builder Form Design tool to include signatures on linked documents which can then be emailed directly. Sign documents such as invoices, quotations, sales orders, purchase orders, receipts, transfers and return authorisations, using either your mouse, touchscreen or a graphics tablet. 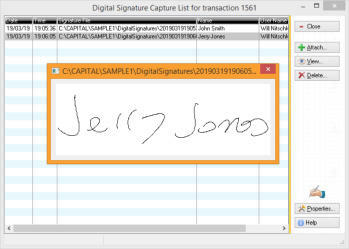 Or a dedicated digital signature capture device such as a Topaz Signature Pad. Show signature on pad (subject to model) and on-screen as signing occurs.